Cooling towers use the evaporation to cool the circulated water. They can achieve water temperatures below the dry bulb temperature – tdb – of the air cooling air but not the wet bulb temperature. 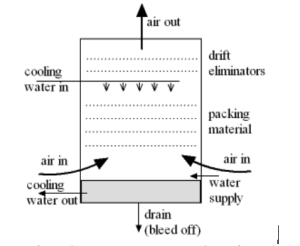 The temperature difference between inlet and outlet water (ti – to) is normally in the range 10 – 15 oF.